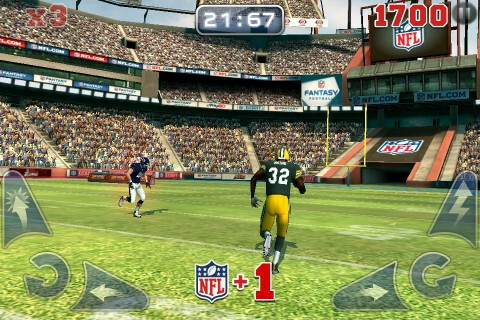 NFL RIVALS is a new iPhone game from NaturalMotion Games. With football season officially underway, it’s easy to understand if you need a quick fix of football action. 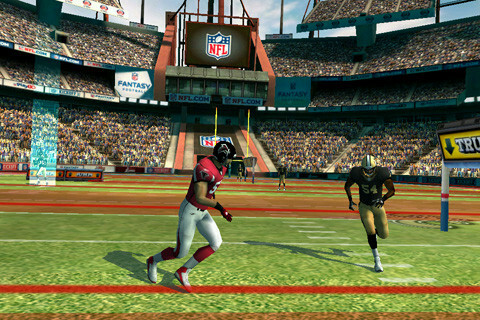 But if the simulation breed of Madden NFL 12 isn’t what you’re looking for, NFL Rivals for iPhone may be the perfect solution. This hard hitting, bone crunching title from NaturalMotion is an extension of the popular Backbreaker series, but for the first time it features all 32 NFL teams. The idea behind NFL Rivals is simple. Create a player, place him on your favorite NFL team, and have him dominate the competition as you go on your way to beating all the other 31 teams. But if you’re familiar with the Backbreaker series, for iPhone, you’ll know that NFL Rivals approaches football in a slightly different manner than the Madden simulation series. Instead, you’ll control your player as he attempts to juke, spin, truck and hurdle past a slew of defenders coming down the field. Each level on offense is you against the other team, with no blockers to help you. If you’re playing on the defensive side of the ball, you face similar odds — no other defenders are on the field to help you bring down the ball carrier, and you must evade the offense’s players on your way to tackling the ball carrier. Critics of NFL Rivals are quick to point out that “it isn’t real football”, and no it isn’t. But it is a fun, fast, arcade version of one of America’s favorite sports. Think more NFL Blitz style gameplay with outrageous hits, nimble players, and taunts that would make Terrell Owens blush. As each level progresses, you’re faced with waves of more players with better skill. For example, your first level (or week, as it’s called) might be against the Detroit Lions before you work your way up to playing the Super Bowl Champion Green Bay Packers. On the field, you accumulate points for performing skill moves, making defenders miss, running over special point “zones” on the field, and of course, for mercilessly taunting the defenders. Each level lasts only about five minutes, which is the perfect length of time for an arcade football fix. Perhaps one of the best additions to NFL Rivals from the Backbreaker series is the addition of competing for points for your favorite NFL team. Now if you play as a member of the Vikings or Cowboys, every point you earn in the game is added to a collective total of everyone playing for that team. Diehard fans will love being able to help move their favorite team to the top of the charts, and within each team you can see who the MVP of the team is, and how close you are to the top of the team, and league leader board. NFL Rivals is a great arcade football game that will always put a smile on any football fan’s face. If you’ve enjoyed the Backbreaker series, or you can’t get enough NFL action, this is definitely a title to add to your iPhone’s collection. NFL Rivals is available now in the App Store for $0.99. AppSafari review of NFL RIVALS was written by Alex Seiver on September 15th, 2011 and categorized under App Store, Games, Sports. Page viewed 6741 times, 1 so far today. Need help on using these apps? Please read the Help Page.